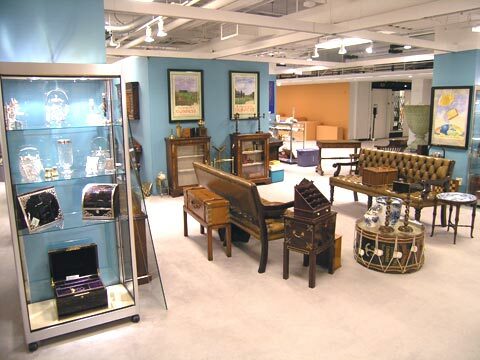 The first time I was to exhibit at the Chicago Merchandise Mart Antiques Show, I was concerned. I was familiar with Chicago unions so I was ready for the worst. Much to my surprise, the union was not my enemy, but my friend. Whenever I needed to have something done, I didn’t have to look far to find a carpenter, porter, electrician, painter or whomever. Everything that needed to get done, got done. It’s such a pleasant alternative to many other shows where setting up can be much more difficult. The show is almost all set up and it’s beautiful. I’m always surprised by the quality. It looks great and it’s elegant. The quality and diversity of the exhibitors is special. Many shows are struggling to attract both enough exhibitors and high quality exhibitors. This fall, the Mart had extra difficulty because the Avenue Show in NYC changed their date from December to the same week as the Mart. As a result, several of the Mart’s exhibitors opted to exhibit in NY, rather than Chicago. The show is a little smaller than last year, but still the best quality. Attendees will not be disappointed. Make the time to visit the show and you will be pleased. The show is open Friday, October 1, 11 am–7 pm; Saturday, October 2, 11 am–7 pm; Sunday, October 3, 11 am–6 pm; and Monday, October 4, 11 am–3 pm. I’m looking forward to seeing my old friends and making new ones. The weather in Chicago in early October is great, the city is vibrant, and the restaurants are superb. Introduce yourself to me and let me know what you’d like to buy, sell or trade. I’ll post results for the show on Tuesday, as the show ends on Monday. If you like my blog, please let your friends know by sending them a link. Then check out my new Daum, Gallé and R. Lalique acquisitions. I’ve listed them all on my website. Here’s the link chasenantiques.com. 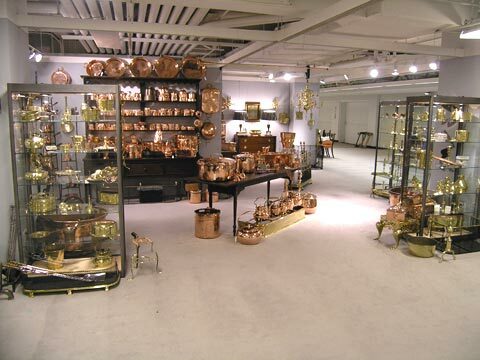 The Merchandise Mart in Chicago runs a very successful antiques show in the late April to early May every year. The success of the show led the Mart to create a fall version, which will open with a preview party on Thursday evening, September 30, 2010. This will be the third time the Mart has run the fall show and it’s getting better every year. It doesn’t have some of the international exhibitors who exhibit there in the spring, but nonetheless it’s an A-1 show that deserves a visit, even if you have to travel some distance. I recently returned from a successful buying trip, so I’ll be bringing some very fine items that you haven’t seen before, especially glass by Daum Nancy, Gallé and R. Lalique. The show hours are Friday, October 1, 11 am–7 pm; Saturday, October 2, 11 am–7 pm; Sunday, October 3, 11 am–6 pm; and Monday, October 4, 11 am–3 pm. Not many shows end on a Monday. I can’t say I’m fond of it, but as this promoter insists on it, we’ll be there until Monday, October 4th. Make your plans to visit the show. The weather in Chicago in early October is great, the city is vibrant and the restaurants are superb. Introduce yourself to me and let me know what you’d like to buy, sell or trade. Check out the newly acquired Daum, Gallé and R. Lalique vases I’ve recently listed on my website. Please take a look by clicking on this link chasenantiques.com. Leland Little Auction & Estate Sales, of Hillsborough, NC, held their September auction on the 18th. Included in the sale were three Tiffany objects, of which two were from the estate of James & Lois Bower of Bement, Illinois. 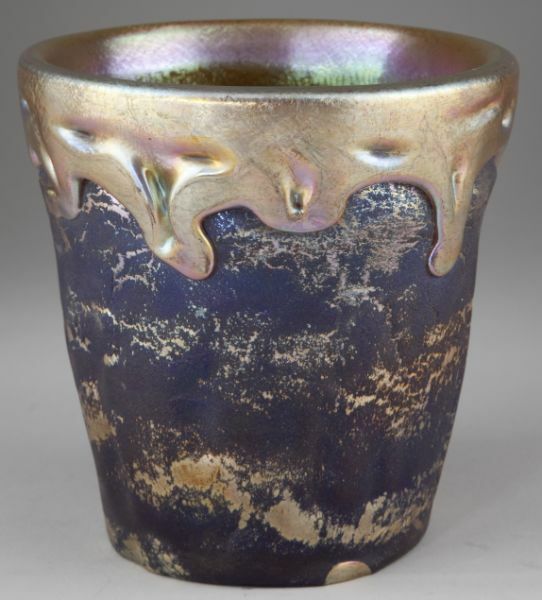 Lot #438 was described as “Tiffany & Co. Favrile Glass Three Handled Vase early 20th century, the organic baluster form with three applied handles, with rich gold overlaid on a bluish-purple body, with paper label and etched “5685 C” and “Favrile.” 6 7/8 in. Purchased from Tiffany’s in New York and thence by descent in the family.” What Leland Little Auctions did not know was that the loving cup was a very desirable example of Tiffany Lava glass. 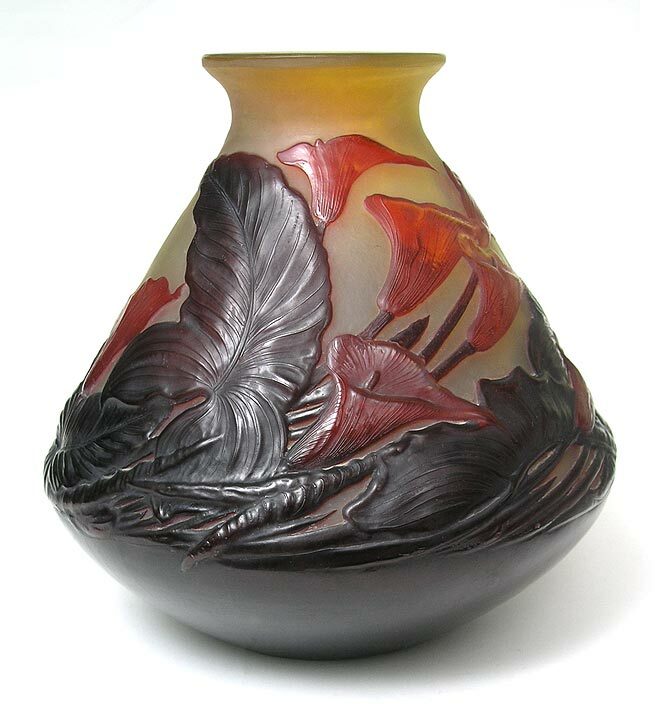 Tiffany Lava glass is quite rare and highly sought after by collectors. Even the best collections have very few examples. The loving cup carried a pre-sale estimate of $1,000-2,000 and soared to an incredible $62,100, including buyer’s premium. Well, not that incredible, because Lava glass commands a premium price and this was a superb example, fresh to the market. As Leland Little Auctions did not know the true value of this item, they did not properly advertise it. That didn’t stop the cognoscenti from finding it. It may even have helped. Everyone thought they were in the game, so the vase had lots of action. The second item from the Bower estate, lot #439, was very nice, but not important. 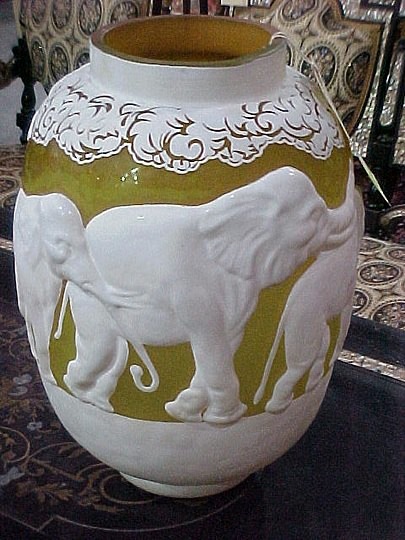 Additionally it had an original flaw on the interior of the vase that looked like a crack, but was not. It sold for $7,475, against a pre-sale estimate of $1,000-2,000. Still an excellent result, but not dramatic. The final Tiffany lot of the sale was #440. 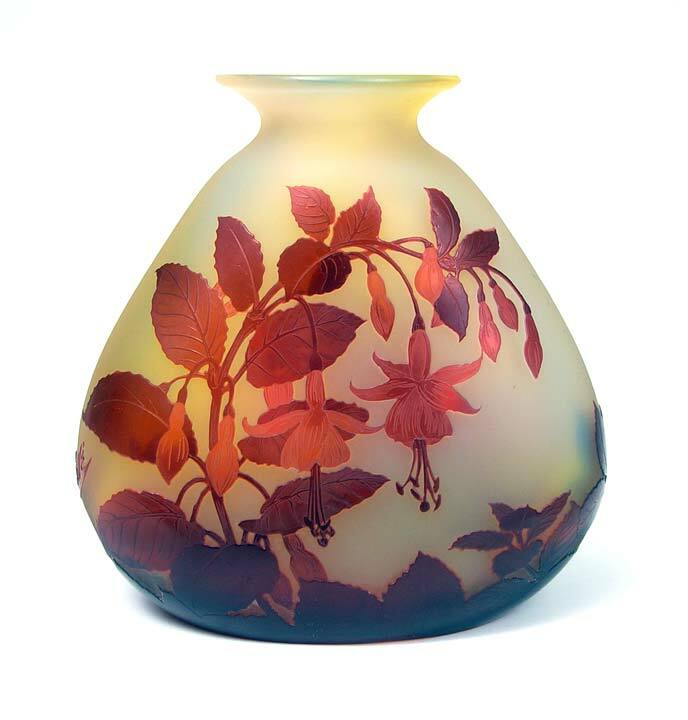 It was another example of Tiffany Lava glass, correctly catalogued by Leland Little Auctions. 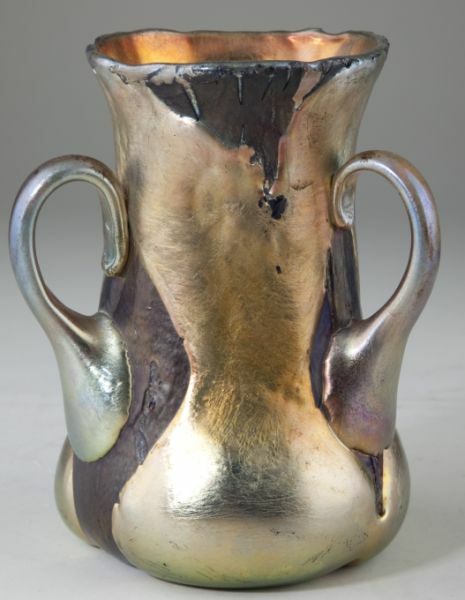 The shape was not nearly as nice as the loving cup, and it was in flawed condition with an internal 2½” crack. This cup was not from the Bower estate, which made for a very rare event. Two of the three Tiffany items offered for sale at that auction were Lava glass. What were the odds? This item did not fare as well. It carried a pre-sale estimate of $2,000-4,000, and sold for $2,300, at the low end of the estimate. That leads me back to my theme of auction estimating, which I have repeated on numerous occasions. If the auction estimates are low, even extraordinarily low, the results will be best. It tells the bidding public that the items basically have no reserve and are there to be sold. 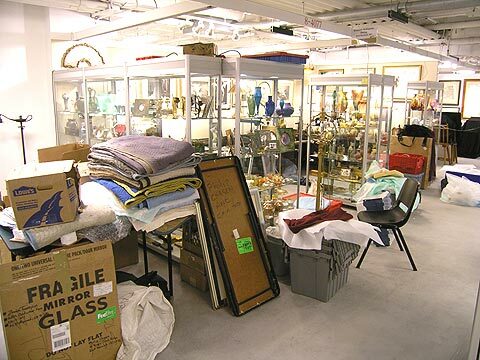 The items will garner exceptional attention and active bidding, usually with very fine results. I just came back from a successful buying trip. Over the next week, I will be adding to my website recently acquired Daum, Gallé and R. Lalique vases. Please take a look. Click on this link chasenantiques.com. The following post took quite some time to write, so I’m leaving it on for an additional couple of days. You won’t want to miss my next post on Wednesday, when I’ll report about an incredible auction result for a rare Tiffany Studios object. 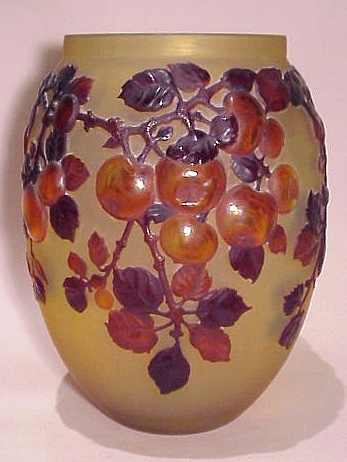 The basic technique used in the manufacture of French cameo glass was acid-etching. After the vases were built up with layers of colored glass, they were then cut back with hydrofluoric acid. The design was protected with a waxy substance called a resist. The process was repeated as often as necessary to create the desired level of detail. The result was a raised design that could be seen and felt with your fingers. The French makers were not content to make the same type of vases again and again, so they experimented with various techniques to achieve different results. It is thought that the technique of mold-blowing by the firm of Emile Gallé was not added to their repertoire until after WWI. By that time, Emile Gallé had already died. Using this technique, the artists first had to carve an original model, from which a mold was made. Molten glass was poured into the mold to create a blank. From there, the techniques were the same – build up the layers of colored glass and then use acid to cut them back. The result was very effective, creating flowers or fruit or animals, that stuck out from the body of the vase and became three-dimensional. In the United States, the Pairpoint Corp. of New Bedford, Massachusetts, patented the technique for “puffy” lamps in 1907. 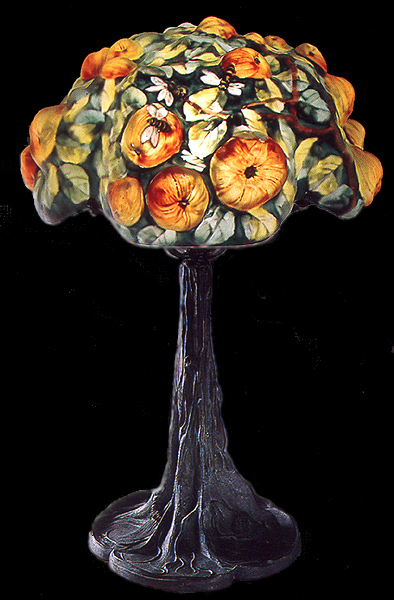 Pairpoint puffy lamps are basically the same as Galle blownout vases, except that the lamps were hand-painted and then fired, rather than acid-etched. It’s curious. Perhaps there was some trans-ocean cross-pollination between the two companies? Perhaps someone at the Galle factory first saw a Pairpoint puffy lamp and decided the technique could be applied to Galle glass? Or the other way around, although the dating makes this less likely? Blownout vases can be of identical form, but not identical. They will differ in color, depending on the choice of colored glass used to cover the blank. They may also differ slightly in design, depending on the etching. Galle produced approximately fifty different models of blownout vases, from small to huge. 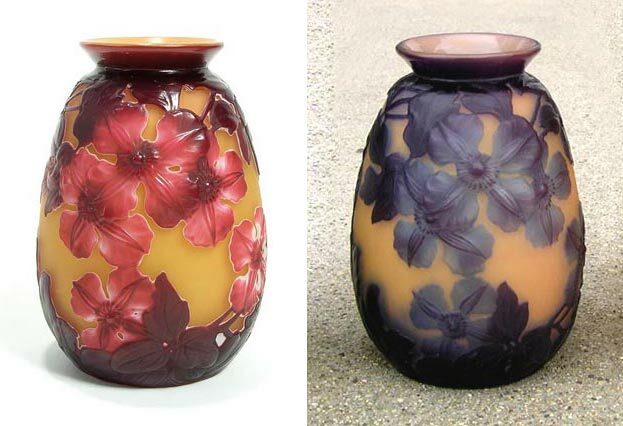 The clematis blownout vases pictured above are examples of small blownout vases, approximately 6″ tall. The calla lily vase is huge and the largest of the blownout vases, approximately 14″ tall and bulbous (from memory and surely not accurate). Blownout vases (sometimes called mold-blown or souffle) are highly desirable and collectible. They have always commanded a premium price over similar, non mold-blown examples. Prices in today’s market range from a low of about $5,000 to over $100,000 for rare models, such as a white elephant blownout. An average price would be about $15,000. Other companies, such as Daum, employed the technique of mold-blowing, but Gallé embraced the technique and produced the largest number of different blownout vases. I’ve seen various collectors put together collections that included a number of blownout vases, but to my knowledge, no one has ever tried to put together a collection with every known example of Galle blownouts. I think that would be a great, fun challenge, but one has to have the means and the desire to achieve it. I just came back from a successful buying trip. 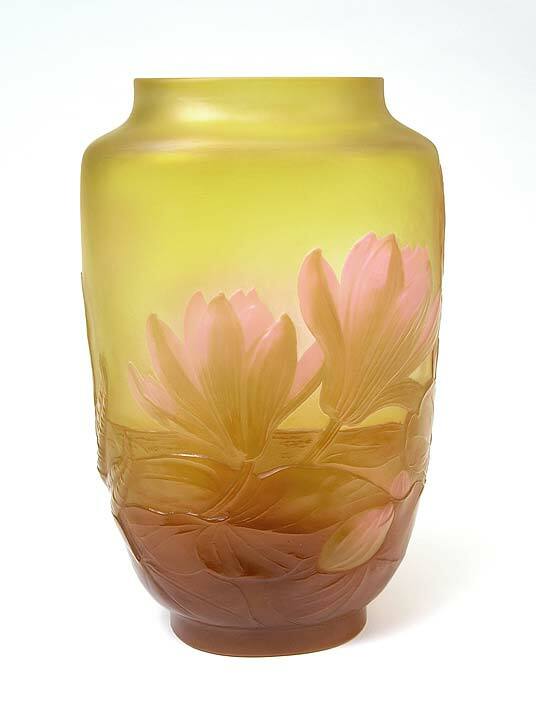 Over the next week, I will be adding to my website recently acquired Daum, Galle and R. Lalique vases. Please take a look. Click on this link chasenantiques.com. On vacation for a week, so no new posts for a little while. The show started off on the right foot with good sales and interest on the first day, Thursday. It looked like the show was going to be a really good one. Then came Friday and Saturday. The Palm Beach Show Group bought the show a few years ago and made a few changes. One was to expand the show to four days, from three. That’s supposed to give the dealers more selling time, but for the most part, it doesn’t work. After all, who comes on the Friday of a four-day show? If you’re a dealer or very interested collector, you come on opening day, Thursday. If you’re busy during the week, you come on the weekend. So it appears that most of the people who come on Friday are just out for a stroll, like going to a museum, except everything is for sale, and you don’t have to buy a thing. And that’s exactly what happened. Nobody bought a thing on Friday. Saturday looked like it was going to be a better day. Lots of people, lots of questions, and serious interest. Based on the serious interest, I should have had a great day, but unfortunately, not one single person returned and the day was a complete bust. Sunday is a funny day. Some are wonderful and others awful. Never know who’s going to show up. Interest was good and sales picked up considerably, with special interest in French glass. All in all, a decent show for me. I spoke to several other dealers. Most of them didn’t lose money, a few did very well, and the rest were satisfied, but with lowered expectations. 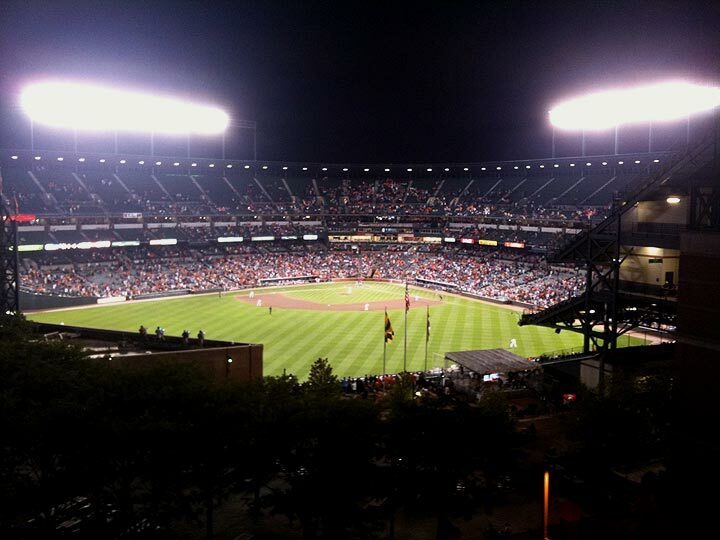 Also on the bright side, the Hilton hotel was wonderful, with an incredible view of Camden Yards from the balcony. Lots of comfortable chairs. It’s as close as you can get to being at the game, without being at the game. The Orioles lost to Tampa Bay, 8-4 — good for the Yankees. 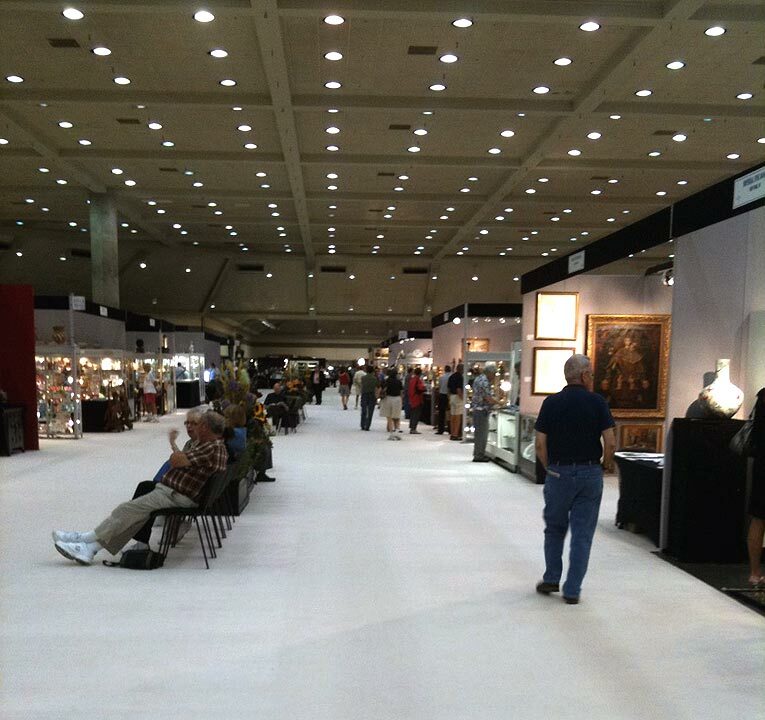 The Baltimore Summer Antiques Show is now open to the public and will end on Sunday, September 5, 2010, at 6 PM. 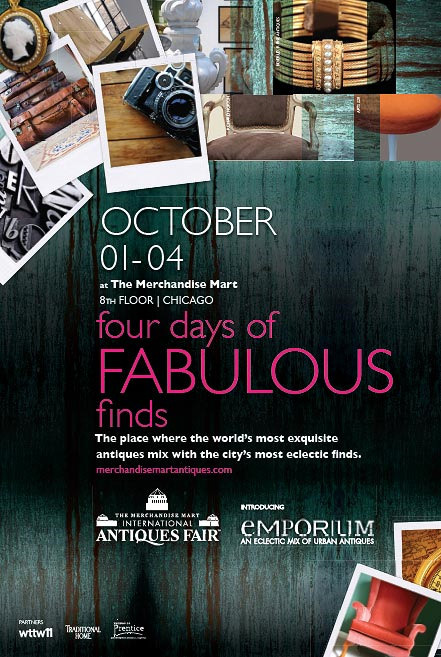 Tuesday and Wednesday was orchestrated chaos with dealers busy hauling in their treasures and setting up the show. In the end, it all got done. Packout on Sunday night is usually a nightmare as everyone is ready to leave at approximately the same time. The logistics of the building make that impossible, so Sunday night is usually a frustrating experience. Most dealers are ready to leave between 8 and 9 PM and many don’t get out until midnight or later. The show looks beautiful. There are more than a few high-powered dealers who exhibit at very few shows, including M.S. Rau, from New Orleans. 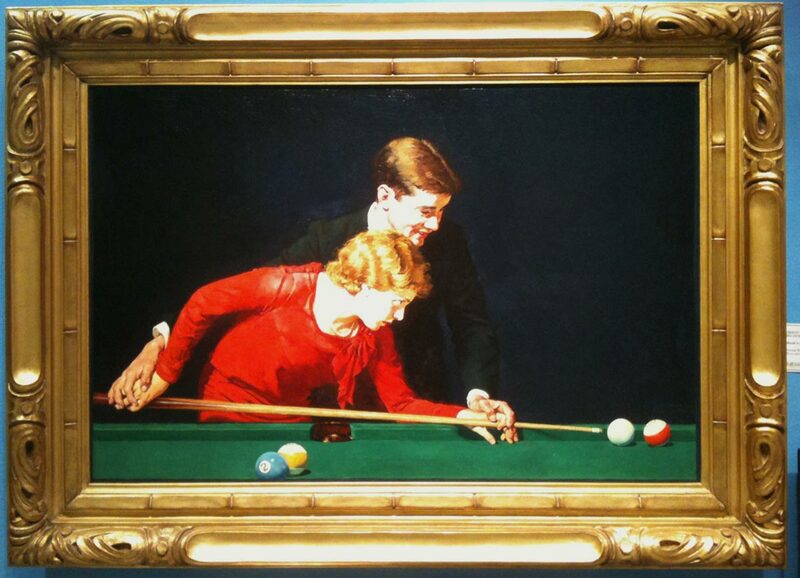 When do you go to an antiques show and have the opportunity to buy an original Claude Monet or Norman Rockwell? You can at M.S. Rau. I’ve brought an incredible selection of lamps, glass, ceramics and artwork. 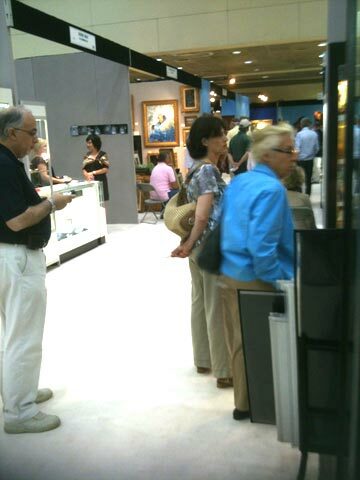 Make the time to visit me and see the summer’s best antique show. Business on the first day was lively, with sales in many different areas from French cameo glass to 19th century porcelain plaques to paintings. If business continues at this pace for the entire show, it will be good evidence that the market is back — a welcome event. On Monday or Tuesday, I’ll report about the results of the show.